Miniature Fluffernutter Cupcakes—My New Favorite Treat! / Hey, EEP! Miniature Fluffernutter Cupcakes—My New Favorite Treat! I was introduced to bulk marshmallow bits (think Lucky Charms) by Lisa, my lovely coworker when I was at Food Network Magazine. She used them to fill clear glass ornaments for a Christmas DIY project. I was obsessed with her discovery! In fact, as a parting gift she gave me a big ol' bag of the marshmallow bits from this brilliant online store to play with. 1. Line mini muffin tins with paper liners. Preheat the oven to 350˚. Whisk the flour, baking powder, salt and baking soda in a bowl; set aside. 2. Beat the butter and sugar with a mixer on medium speed until light and fluffy. Beat in the peanut butter until combined. Add the eggs, one at a time, beating well after each addition. Alternate adding the flour mixture and sour cream in a few additions, scraping down the bowl as needed. Beat in the vanilla. 3. Divide the batter among the prepared muffin cups, filling each about halfway. Bake until a toothpick inserted into the center comes out clean, 8 to 10 minutes. Let cool completely on wire racks. 4. 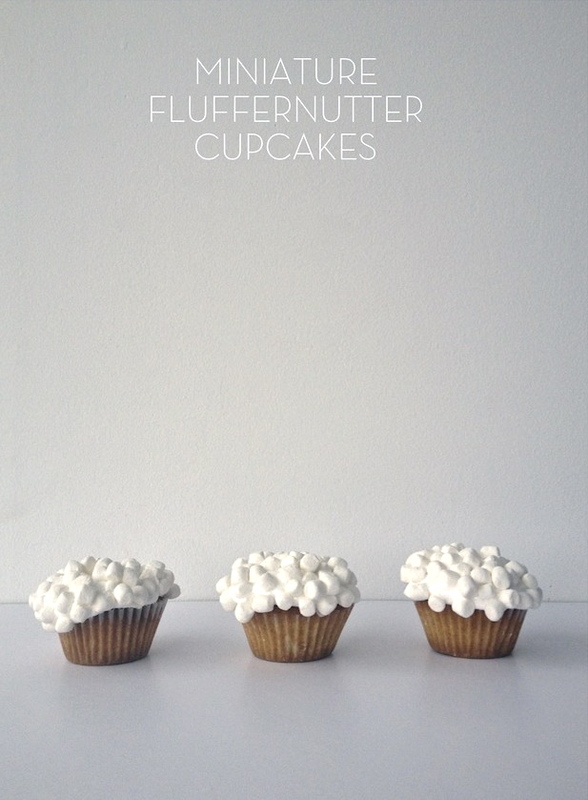 To assemble, spread marshmallow Fluff on each cupcake for frosting. Roll in mini marshmallow bits.